Encryption was interrupted and can't complete. As a result, the data on your phone is no longer accessible. This problem is usually cause when you factory reset or flash in a new firmware. To resume using your phone, you must perform a factory reset. When you set up your phone after the reset, you'll have an opportunity to restore any data that was backed up to your Google account "
Then your /data or /SD card partitions might be corrupted . 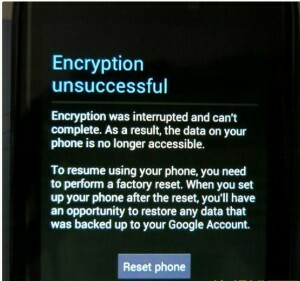 To resolve this issue, click the "Reset phone" button at the bottom of the message or boot into recovery mode and select the Wipe data / Factory reset option. You could also wipe cache partition for good measure. If the issue persists then format the SD memory card, slot it back in then reboot the phone . If a factory reset in recovery mode fails to fix it, boot into factory mode (volume down + power button). It'll display in Chinese. Select the option which has "eMMC" in its name and wait for it to complete then reboot the phone. If wiping EMMC also failed then download and flash cwm recovery in the phone and wipe userdata and cache or get TWRP touch recovery for your device and wipe userdata and cache.